I have been categorizing the thousands of photos that I have taken over the last few months trying to decide which bird to write about next. It is not an easy decision as there are so many species and each has a uniqueness that can only be revealed through close observation. 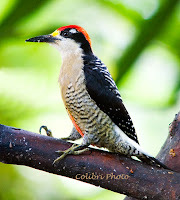 I settled on the Black-cheeked Woodpecker for its beauty and the abundant opportunity for encountering this amazing bird. The Black-cheeked Woodpecker is most often seen in the humid forests below 800 m (2,600 ft.) but it can also be observed locally in the Mindo area up to 1,500 m (5,000 ft.). It darts behind tree trunks and gleans the larger branches of tall trees but it will come out in the open for a good view and some decent photos. It can be seen in mixed flocks with tanagers and is not extremely aggressive, allowing the other species to bully them. They are a colorful bird with the males and females fairly similar in markings. Look for the mid-crown to tell the difference, the male being red while the female is off-white. 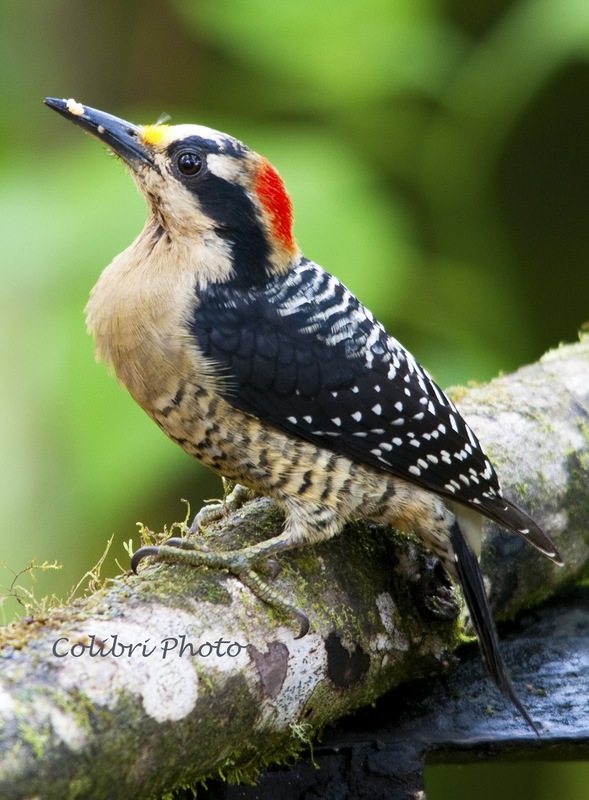 The Black-cheeked Woodpecker is pretty much an insectivore but will eat fruits and berries when available. Small flocks have been known to cause significant damage to banana plantations and are considered a bane to farmers. There are tanager feeders at Milpe Bird Sanctuary and Mirador Rio Blanco and this lovely bird is known to frequent them along with the tanagers and other species. While out walking in the lowlands and foothills of the western Andean rainforest be watchful for this magnificent woodpecker. Take a little time to observe its habits and idiosyncrasies to enjoy the full wonder of this wonderful species.